What is a Contour Grid? Not all internal grids are the same. Sometimes called “Colonial Lites” because they help give the window an architectural colonial-style appearance, internal grids are designed to simulate old-fashioned muntins. Muntins are sections of window sashes that were used in years past to hold small lites of glass in place. Early glass processing only allowed roughly 10” squares of glass to be manufactured, and these wavy little panes of glass were held in place by muntins to build “true divided lites”. For many years, TDL’s were the only way to make a window. As float glass processing and quality improved, the resulting larger dimensions of flat glass made it possible to create double-pane glass using big sheets cut to size. Since it was increasingly costly to make true divided lite windows out of insulating glass that required muntins to hold them in place in a window sash, alternative processing methods and designs came to be very popular. One of these alternatives involves roll-formed and painted hollow aluminum grids that are cut like Lincoln Logs® and fitted together into a sub-assembly. 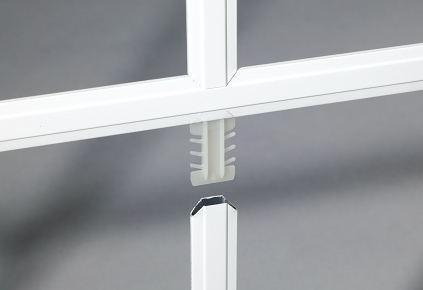 This sub-assembly structure, pictured in part above to reveal the connecting nylon key, is then carefully fitted into an insulating glass unit before it is “sandwiched” together and hermetically sealed. The result is an inexpensive alternative to true divided lite windows, which allows for easy cleaning and no muntin maintenance with the same general look. While standard grids are flat and about 3/16” x 5/8”, wider sizes and contoured shapes such as those pictured above are popular in some markets.